It was a parade unlike any other – Jesus’ triumphant entry into Jerusalem on Palm Sunday. It was a big deal, but what did it all mean? This message for children will explain the meaning behind the celebration. Use the download links below and watch the video teaching example. Main Objective: As the church prepares to enter its most significant celebration with Holy Week and Easter, Palm Sunday is an exciting “kick-off” of sorts. Yet even as we wave palm fronds and prepare to worship, not everyone understands what the meaning behind the activity is. This message offers a simple overview of the triumphal entry, and why it is significant for us. Law/Gospel Theme: Jesus came to save, but not always in the way people expected. He came to deliver from sin, but some of the people anticipated political rescue. If we are not careful, we can impose our own misguided hopes on Christ. When we do this, we miss the true joy that is to be found in Him alone. Optional Materials: Palm branches, branch of other type, stuffed animal(s), flag. Use these items to make the lesson hands-on. Have the children take turns waving the items as you tell the story. “Hip hooray! Hosanna! Yay! Wahoo woohoo! Good morning everyone! So I was reading through today’s Gospel story and, well, I actually sort of skimmed it over, I didn’t have time to read it too carefully. But, I know there was something about branches, and riding an animal, and people got all excited…right? Did I get it? (Pause for hopefully confused and negative comments) Well, maybe I missed something in the details there. Hmm, why don’t we take a moment to talk about what was going on in this passage? See, what happened here in Jerusalem was sort of like a big parade. Have you ever seen a parade? (Allow responses). Well, this was a special sort of procession. It was a parade for Jesus. There are a few elements that are important in this story. For one thing, did Jesus ride through town on a limo or a float? No, He came on a donkey! This was important partly because it showed that He was coming humbly and in peace. A donkey isn’t a big fancy war horse, it’s just a work animal. Also, by coming on a donkey, Jesus was doing something that a prophet had predicted long before He was even born. That showed God was following through on His big plans. Now, while Jesus was coming into Jerusalem, people lined up to welcome Him. They put their coats on the ground, sort of like a fancy red carpet, but also to show that the people respected Jesus and considered Him their king. They waved palm branches, sort of like you might wave a flag at a big parade. The palm branches showed celebration, and were also a sign of victory. The people wanted Jesus to bring victory and good things. While they were celebrating, the people lining the path also shouted something. Do you know what it was? 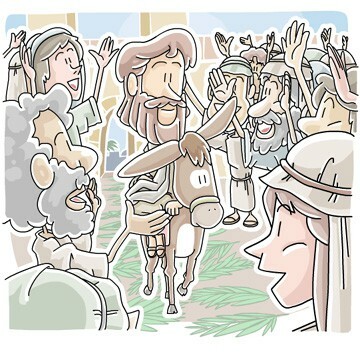 They hollered “Hosanna!” Do you know what Hosanna means? It means “save us.” The people wanted Jesus to save them, and they expected that He would be able to do it. Jesus did come to save, but it was not exactly in the way folks anticipated. The people in Jerusalem thought He was going to be an earthly king and save them from political tyrants who were mistreating them. As we know, this is not exactly what happened. Jesus rode triumphantly into town, but by Friday He was hanging on a cross. He wasn’t saving them from political leaders, but He was saving them from something much bigger, and in a way that was much better. It was better than anything anyone could have hoped for. You know, sometimes we want to put our own expectations on Jesus, too. Maybe we have an idea of how we think He should answer our prayers or work in our lives. We get confused or upset when God’s ways don’t look like we would hope. But we can be assured that God has much bigger plans in mind. He has delivered us and continues to do so. Our job is to continue following and praising Him. In the Bible story, some of the church leaders told Jesus He should quiet down the people and not let them make such a fuss. Jesus said if they didn’t call His name, the rocks would cry out instead. So let’s be better than rocks! We want to proclaim the amazing works of Jesus and tell everyone how wonderful He is. Let our lives as well as our words declare His power. Hosanna! Tony Kummer (Editor) reviewed & updated this page on : April 14, 2019 at 6:41 pm. All our content is peer reviewed by our readers, simply leave a comment on any post suggest an update.